Vest Pocket Map of New York. 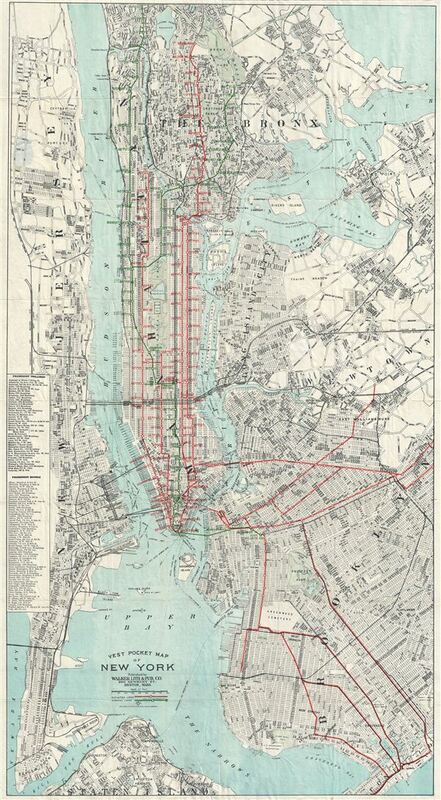 An extremely large c. 1907 map of New York City by Walker and Company. Walker's large scale folding map covers all of Manhattan, most of Brooklyn, Queens, and the Bronx, and parts of adjacent New Jersey. Only one subway line appears on the map and is highlighted in red. This is the IRT (Interborough Rapid Transit Company) running between several centers in the Bronx, through City Hall, to Atlantic Avenue, Brooklyn. The remaining public transport lines highlighted in green are part of the private above ground urban rail network in place prior to the full development of the centralized subway system. This unusual piece was a joint project between the Boston lithographer and map publisher George Walker (400 Newbury Street, Boston) and the New York firm of Wehman Brothers (158 Park Row, New York). Though undated we did discover a copyright registration for this map in 1907. The subway line terminates at Atlantic Avenue, the station for which was officially opened in the spring of 1908. It is however, not uncommon for cartographers to include projected improvements on their maps in order to keep them current beyond the initial publication date. Very good. Some minor wear and verso reinforcement along original fold lines.